Do you love Singapore food? There's so many uniquely Singapore food here that we really have no idea where to start with. But thankfully, the Singapore Favourite Food Village (SFF Village) happening from 12 to 21 July 2013 is exactly a convenient platform for you to begin with. The Singapore Food Festival is celebrating its 20th anniversary as well as the evolution of Singapore's culinary landscape over the years. To increase awareness of the culinary heritage of Singapore, the Singapore Favourite Food Village in particuar is held to feature 40 top local dishes, some of which are voted by the public online. Thanks to Openrice, I was able to try out some of the food showcased here. 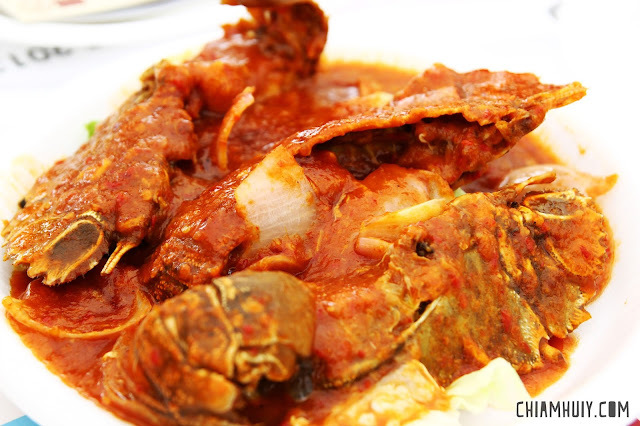 So what can you expect at the Singapore Favourite Food Village? This post will cover about a quarter of the total number of stalls, so it's actually quite an extensive number at SSF Village. The area is rather huge so fret not about not getting a seat. The Oyster Omelette was a little disappointing because it consists more starch than the crispy fried egg. There are only a few oysters in it, though they are pretty fresh. The whole thing was a tad too soggy and oily. I would say the Salted Egg Yolk Pork Ribs is recommended for its succulent and juicy pork meat. Though its labeled as pork ribs, the meat are mostly de-boned thus easy to consume. The graininess of the salted egg yolk sauce are just nice, complementing the well-balanced saltiness from the egg yolk and scent from the curry leaves. The portion is a little small for the price though. Despite being deep-fried, the pork ribs are still able to retain the moisture and juiciness. Recommended! The Golden Mantou (fried bun) that comes with it are alright. Soft on the inside and crispy on the outside; tasted the best when dipped with the chili crab sauce. The buns are not very oily either. This huge piece of stingray only cost SGD15, I'm impressed. Usually I get BBQ stingray at about this price and there wasn't much meat at all. For this one, not only was is thick and meaty, the meat itself has really locked in the flavours from the BBQ chili sauce. The sambal chili sauce coating the fish was refreshing and spicy at the same time, and it manages to leave me asking for more drinks to curb the spiciness. BBQ Stingray aside, the stingray curry puff is truly an unexpected one. Personally, I've never heard of stingray curry puff and I was eager to try it out. Pry open the curry puff and you'll first notice a huge piece of sliced boiled egg (that's generous). The stingray meat are well-hidden among the curry paste, but the texture is definitely there. The crust is not too thick, and not too floury as well. Oh, this curry puff is really spicy. Try the stingray curry puff for some exotic experience. Firstly, this portion is a little too pricey for sgd8. Other than that, most of the ingredients are indeed fresh, though I would prefer a wetter version rojak. For some reasons I start to love cuttlefish more and more, although it's really tough to make cuttlefish to taste flavourful for its bland nature. But I thought the sauce that comes in this Sotong KangKung complements the crunchy cuttlefish with its sour taste. Peanut is also drizzled onto the cuttlefish to increase texture. I honestly feel that after trying the Eng Ho Hokkien Mee, it's really hard to find another better one. That said, the Hokkien Prawn Mee from Zheng Xin Si Chao used thick bee hoon instead of the thin ones, so those who love thick bee hoon will probably prefer this more. However, their version is neither wet nor dry, it's just a good balance. The ingredients used are definitely really fresh so it makes this a pretty decent plate of hokkien mee. Sgd6 for this plate is a little pricer than hawker standards too, although I have to admit prices will be inevitably jacked up by a little for this kind of occasions. For sgd6.50 a plate of roughly 10 satays, each probably cost 65cents. What attracts me the most about the satays is their juicy and not overly charred satay meat. I love it when I dip the whole satay stick into the satay sauce for an experience of bursting flavours and texture from the grounded peanuts inside the satay sauce. Didn't get to try this as I was super full by then. Is ngoh hiang supposed to be crispy? If yes, this version probably didn't acheive that expectation because though served hot, the texture was a little too mashy and flimsy. Not very recommended. This plate is probably the best that afternoon. A plate of not-too-greasy fried kway teow served with bountiful cockles and sausages. The beansprout that comes in it added a much crunchier texture to the smooth kway teow. We tried the white version of the carrot cake. Served with a pool of sambal chili at the side, the carrot cake is pretty decent in terms of crispiness and chewiness. Best eaten when served hot. Didn't get to try this too. But judging for the looks, there is an overwhelming of ice and little ingredients. One of the official beer for Singapore Favourite Food Village. Honestly, there are just too many things to choose from and you'll be so spoilt for choice! Which is why, I would really recommend you to come in a big group because that's where you can share among many, and still able to try each dishes. Some of the dishes that are really worth a try would be the Char Kway Teow, BBQ Stingray and Hokkien Mee (although definitely cannot fight Eng Ho Hokkien Mee). You may also catch some video excerpts on Openrice too! Find out more on OpenRice Facebook Page and OpenRice Website. To enjoy privilege such as food tastings, make sure you sign up as members at Openrice! Hi there! Nice to read about your perspective on the event! The cuttlefish kang kung dish is actually a Teochew dish that is being served together with Satay Beehoon. A Teochew at heart, I found it lacking depth in terms of flavour when it came to the sauce though the cuttlefish was cooked beautifully through blanching. If you enjoyed the dish, I would recommend trying this hawker stall over at ABC Brickworks Market down Bukit Merah. There is only one stall there that sells it, can't remember the exact name but it is beside a stall selling fish soup which is highly recommended as well! The sauce is a lot better with a bolder and stronger taste and flavour to go with the plain cuttlefish! Their satay beehoon is also a MUST-TRY if you are there!